Rainbow Six Siege’s worst character is in line for a rework. ‘Lord’ Tachanka has long been considered the least effective operator in the game, but a recent Twitter post suggests that could be set to change in the not too-distant future. Robinson agreed with the player, but went on to say “not forever though.” That statement, while vague, has set the rumour mill rolling, and the Rainbow Six Siege community quickly took to figuring out what a potential Tachanka rework might look like. Much of the discussion focuses on the operator’s lack of mobility – not only is he a heavily-armoured ‘one-speed’ character, but his unique gadget is a mounted LMG, which essentially requires him to stay rooted to the spot while he fires it. While that LMG does come with a shield to keep Tachanka’s head safe, sitting still often ends up being a pretty deadly habit in Rainbow Six Siege, and the operator has proved pretty useless over the years, to put it politely. Community suggestions about how to improve our lord and saviour also suggested buffing that shield, or allowing Tachanka the ability to move his turret around, although that might be tricky given the game’s destruction mechanics. It’s worth pointing out that Robinson’s comment is far from an official announcement. 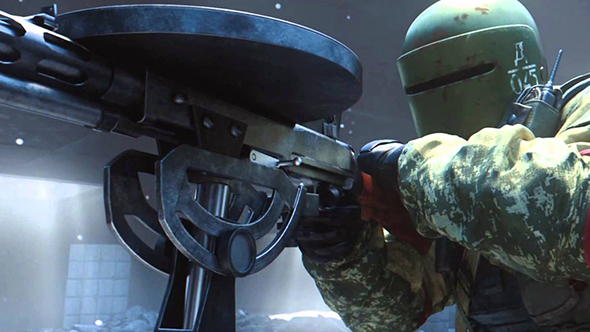 That said, if a Tachanka rework was on its way, he’s the kind of person who’d know about it. As for when it might make it into the game, hopefully we’ll see a new look Lord some time during Year 4.